Are You Manly Enough to Wear Pom-Poms on Your Shoes? Now that Jess is gone for a couple weeks, it’s a good time to talk about pom-poms. Specifically the kind worn on the ends of shoes. If your grandma knitted her own slippers, she may have stuck pom-poms on the toes just for a sassy affectation, happy about the way they bobbled around as she did her housework. For those of you who don’t know, Joe and Jess are on their honeymoon in Greece, and if they hit the right part of Athens, they’ll see men wearing pom-poms on their shoes. These guys goose-step around, too, which only adds to their allure. Thankfully there’s no ouzo involved. 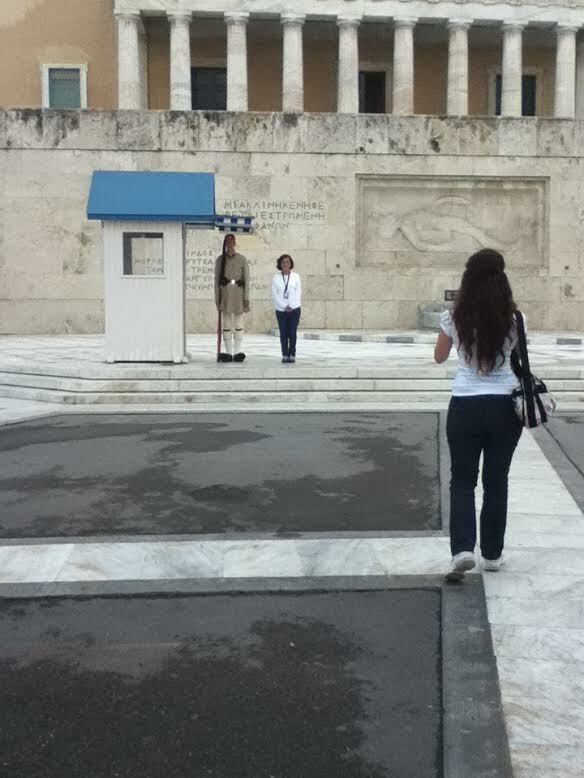 When we were in Athens a few years ago, we spotted these guys at Syntagma Square. 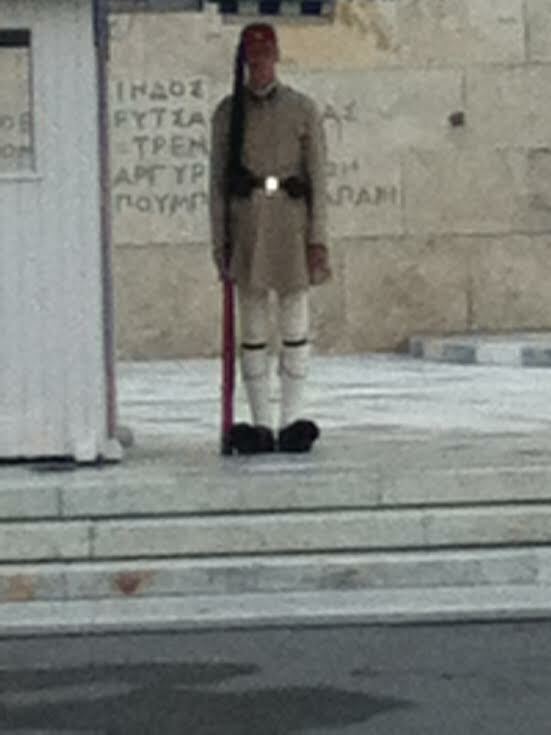 Our tour guide told us that they were Evzones, members of an elite force that guarded the Tomb of the Unknown Soldier. And man, were they serious about their duty. They marched back and forth with such ramrod precision that I felt slouchy and undignified in their presence. When they met at the top of the stairs and executed an abrupt turn and marched down, a lady in our group grabbed her camera and started snapping away. Woe be unto her, because the Evzones kept goose-stepping rigidly forward, plowing right past Camera Lady, who almost bit the dust in her zeal to get a good shot. I imagined her, limp and bloodied on the sidewalk, a fuzzy pom-pom sticking out of her nose. Really, what was the deal with those things? They seemed frivolous and unnecessary, almost humorous when compared with the semi-automatics the Evzones carried. Now those babies I took seriously. They elevated the goose-stepping to a don’t-mess-with-me meanness that made me gulp. And when I found out that the Evzones’ shoes weigh seven pounds and have nails under their soles? Boy, Camera Lady was just lucky to be alive, is what I thought. Our tour guide told us that in the 1800s, when the Evzones prepared for combat, they would hide knives under the pom-poms. If they were captured in battle – fwip! – out came the knife, ready for action. Cool, I thought, mentally elevating the status of the lowly pom-pom to Fuzzy Defender of the Faith. Someone else in our group, a Mr. Historical Know-It-All, challenged our tour guide, saying he heard the pom-poms were used to keep water from leaking in the seams of the shoes. Sorry, buddy, I thought. Water leaking in?? What a yawner. Knives were much more interesting, and gave the soldiers a sinister presence. Water leaking in made them sound like practical gardeners. So, Jess and Joe, if you’re reading this, head on over to Syntagma Square and check out the Evzones. Hoist an ouzo in their honor, and if you’re secure in your manhood, stick some pom-poms on your shoes when you get home. Just don’t goose-step around the front yard. Deanne M. Schultz is currently working on The Green Hornet Suit and Other Musings, a book that takes a wry look at life as she sees it. 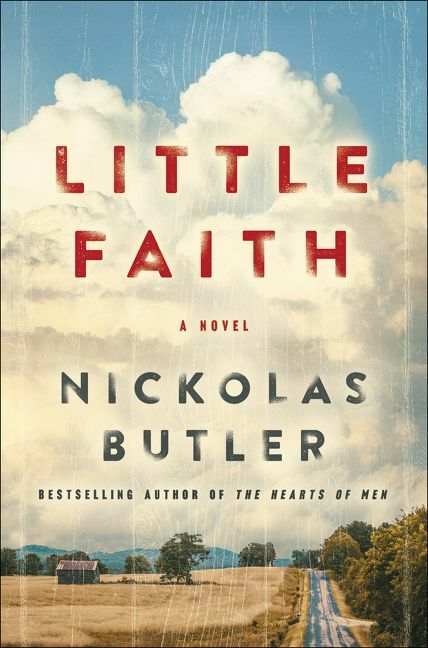 Her hope is that her writing inspires and helps others, moving them to connect with those around them. 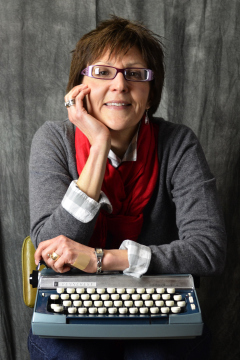 She blogs at dmswriter – witty weekly writing to inform and entertain.